If you are in need of a new look for job searching or an interview, drop by and check out our selection of men's and women's clothing (and even some shoes). 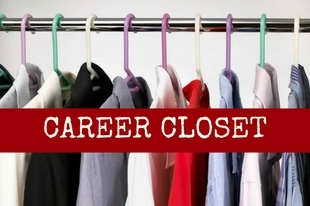 It's all FREE, and if you can't find what you need from our Career Closet, we may be able to provide you with a free clothing voucher from a community partner. To use this service, just drop by our Port Alberni Centre, and speak to one of our Resource Centre Advisors. AVEC staff in our Resource Centres are always available to help you in your job search - whether it's proof-reading your resumé, helping you to navigate the many available online resources, or answering questions you may have about our services. For more information, or to find the location of the centre nearest you, visit our Contact Us page.